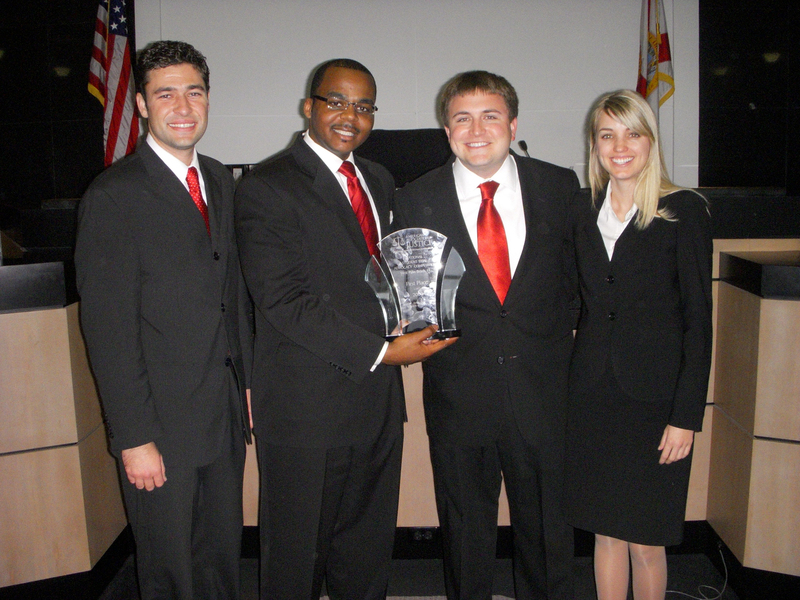 Stetson Law's team won the AAJ National Student Trial Advocacy Competition. (L-R): Nelson Baez, Aaron Watson, Derrick Connell, and Sara Mieczkowski. Click for high-resolution image. A team of four students from Stetson University College of Law won the prestigious American Association for Justice (AAJ) Student Trial Advocacy Competition during the finals in West Palm Beach, Fla., April 2-5. Stetson’s team of Nelson Baez, Derrick Connell, Sara Mieczkowski and Aaron Watson scored consecutive victories in mock trials against teams from Loyola of Los Angeles, University of Maryland, Loyola of Chicago, and Samford University. “This is the most prestigious competition in the nation because of its scope and the participation of distinguished members of the bench and the attorneys who judge the competition,” said Nathalie Etori, manager of the AAJ event. The competition began with a staggering 248 squads from 147 law schools. Stetson advanced to the national final after winning a regional tournament in Providence, R.I., five weeks ago. Stetson Law’s fourth championship in the national competition, which has occurred annually for more than 25 years, has created a sense of accomplishment among trial team participants. Connell said that since receiving the tournament case file in January, the trial team has been practicing nearly every day. He attributes their success to strong coaching and to how well the students worked with each other. Judge David A. Demers, Adjunct Professor Susan Demers and Professor Roberta Flowers coached the winning team. Trial advocacy competitions allow law students to practice their trial skills before distinguished members of the bar and bench. Teams are judged on their skills in case preparation, opening statements, use of facts, the examination of lay and expert witnesses, and closing arguments. For more information about Stetson’s advocacy programs, see www.law.stetson.edu/excellence/advocacy.